Cure CP has assisted hundreds of children with cerebral palsy by helping to fund projects designed to improve their quality of life. Here are a few stories of children who have participated in clinical trials co-funded by Cure CP. Bower is a shining example of why we work so hard to fund research at Cure CP. 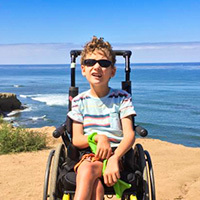 His story illustrates the strides CureCP is making in funding critical research to improve the lives of children with cerebral palsy. Bower was lucky to be chosen for the bone marrow CP clinical trial at the University of Texas Health Science Center (Houston). After the trial his mother noticed a significant improvement in his speech and head and trunk control after his bone marrow stem cell transplantation. 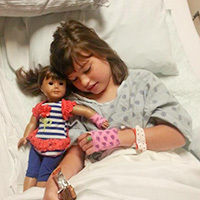 Mattie is a vibrant 11 year old girl who is one of 15 lucky children participating in a bone marrow stem cell rejuvenation trial at the University of Texas Health Science Center (Houston). This trial is designed to help repair the neurological damage in her brain that is causing her cerebral palsy (CP). Her parents are hopeful that this trial will open the door for other children with CP like Mattie. Your generous donation will go far in helping these children and the many others who are awaiting an opportunity to participate in a research trial. Every dollar helps get us closer to that goal: being able to help and treat every individual with CP. All donations to Cure CP are tax-deductible and processed on a secure server. Any amount helps fund research for those affected by CP. Subscribe to our newsletter for up-to-date information on Cerebral Palsy.